Mix a master puppeteer named Gaspar Grisini, tormented witch Cassandra, two orphans named Lizzie Rose and Parsefall, and a kidnapped little rich girl called Clara and what do you get? The joy of reading this astonishingly original novel by Newbery Medal winner, Laura Amy Schlitz. 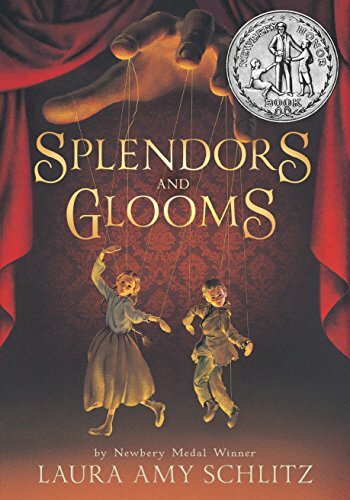 Set in Victorian London, this darkly Gothic jewel opens simply enough when Clara Wintermute begs her wealthy father to bring Grisini’s puppet show to the family home for her twelfth birthday party. Clara offers Grisini’s orphaned assistants, Lizzie Rose and Parsefall, tea and toast in the drawing room while Grisini prepares for the puppet show. The splendor of the Wintermute mansion dazzles the orphans as much as the clever dancing puppets dazzle Clara. Clara is the sole survivor of several siblings who succumbed to cholera; she lives with that guilt and the fear that her parents wish she had died instead of her twin brother. But when she goes missing the day after the puppet show, her distraught parents are frantic to find her. Grisini is questioned by the police, as are Lizzie Rose and Parsefall. The police search their shabby rooms in a boarding house for clues to Clara’s disappearance but find nothing. Lizzie Rose and Parsefall discover and report Grisini’s criminal past to the police. For it turns out that Clara is not the first child to disappear after one of Grisini’s puppet shows. Just as Grisini is ready to collect the ransom from Clara’s father, he’s injured in a fall at his boarding house when he tries to teach the orphans a lesson about talking to the police. When he regains consciousness, however, he cannot collect the ransom. Instead, Cassandra is calling him, and he must yield to her magical summons. Against his will, Grisini joins Cassandra at her bewitched country estate, Strachan’s Ghyll. The two have a long history of magical rivalry, for Grisini is not just a skilled puppeteer, he is an expert and evil magician. Cassandra wears a stunning fire opal around her neck that’s imbued with the ability to create powerful spells. It also both speeds her death and strengthens her powers. She wishes to rid herself of it, but she cannot give the opal away; it must be stolen from her. Grisini wants the opal for his own purposes even though he knows its dangers. With a misleading letter, Cassandra lures Lizzie Rose and Parsefall from London to her estate with a promise to bequeath them all of her treasures. Even though the children don’t know her, they are so desperately poor and alone, they make their way to Strachan’s Ghyll to meet with Madama, as Cassandra prefers to be called. Unbeknownst to Lizzie Rose and Parsefall, they are carrying the kidnapped girl Clara with them. She is hiding in full sight, for Grisini has turned her into a ballerina puppet. The opal allows Cassandra to enter Clara’s mind; the girl can see and hear and think, even though she is tiny, and her limbs are now controlled by puppet strings. The action soars to unexpected heights once all the characters have gathered around Cassandra’s bedside at Strachan’s Ghyll, as the children’s true natures guide them to take the actions that result in the destined consequences. The story’s closing is well rounded and extremely satisfying. The setting swings between abject poverty and resplendent riches; the characters are well drawn; and the story is uniquely intriguing. What more can a reader ask? Capable middle-grade readers—such as those who managed the Harry Potter books on their own—can successfully tackle Splendors and Glooms. It also makes a dazzling read-aloud book for anybody who enjoys hearing the spoken words of a brilliant story well told.